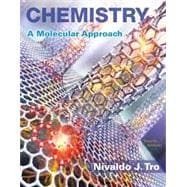 Nivaldo Tro presents chemistry visually through multi-level images—macroscopic, molecular, and symbolic representations—helping you see the connections between the world (macroscopic), the atoms and molecules that compose the world (molecular), and the formulas you write down on paper (symbolic). The benefits of Dr. Tro’s problem-solving approach are reinforced through digital, Interactive Worked Examples that provide an office-hour type of environment and expanded coverage on the latest developments in chemistry. New Key Concept Videos explain difficult concepts while new end-of-chapter problems including Group Work questions and Data Interpretation and Analysis questions engage you in applying your understanding of chemistry. The revision has been constructed to easily incorporate material in Before, During, and After class activities. Mastering brings learning full circle by continuously adapting to your learning and making learning more personal than ever—before, during, and after class.